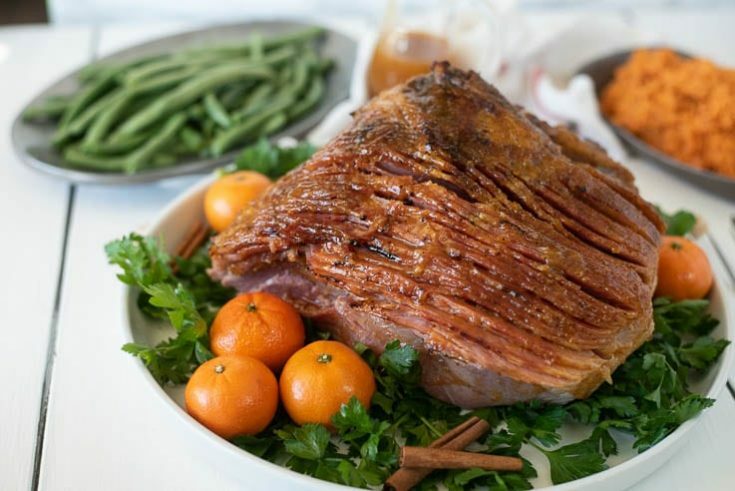 Mandarin Orange Spiced Glazed Ham is everything you want for an easy holiday ham. 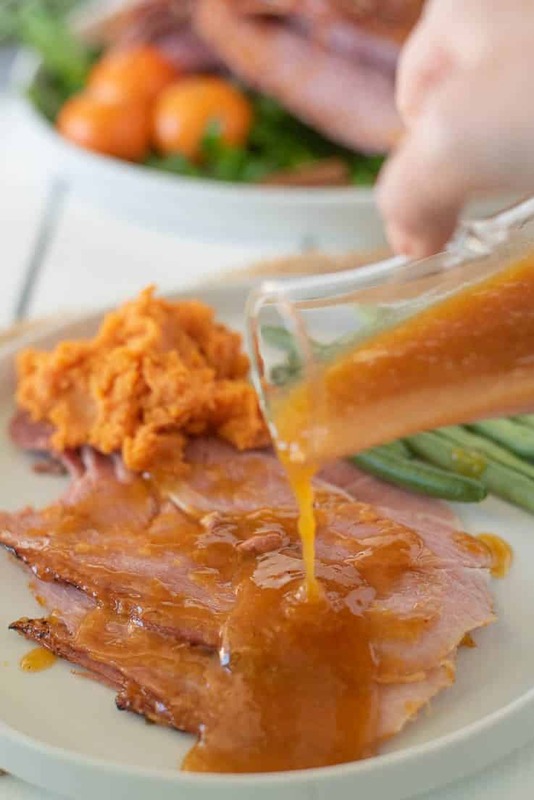 The sweet glaze has seasonal spices that create a delicious crispy edge on the ham slices when re-heated in the oven. 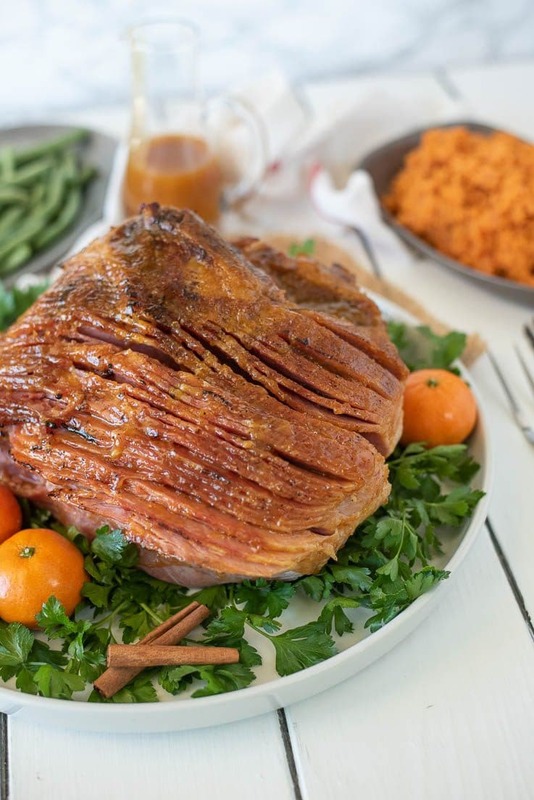 I have once again partnered with everyone’s favorite canned fruit company Dole Packaged Foods, to bring you this wonderful ham that is the only holiday ham recipe you need to make holiday memories. Every Christmas Eve since he was a young boy, my husband’s mother made a glazed ham, sweet potato mash and green beans. I am happy to keep this tradition going by serving the same meal every year for my husband to keep the holiday memories of his mother going for many years to come. Dole Mandarin Oranges are the perfect base for this glaze. 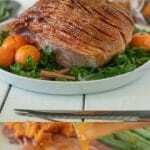 Along with a few seasonal spices like cloves, cinnamon, ginger and nutmeg, brown sugar and honey to create help caramelize, anyone can make this easy glaze. The mandarin oranges come in 15 and 11 ounce cans that have a convenient pop-top lid so you don’t even need a can opener. The all-natural fruit is Non-GMO (non genetically modified) and a good source of vitamin C.
This glaze is spiced, not spicy. Spiced meaning it has added spices but is in no way spicy. Just wanted to clear that up. To make life easy I used a pre-cooked, spiral-cut ham. It takes 10 minutes to make the glaze and 1 hour to bake the ham to heat it through and caramelize the glaze that makes a delicious crispy edge on the ham slices. Be sure to reserve some of the glaze for serving, like a gravy if you will. 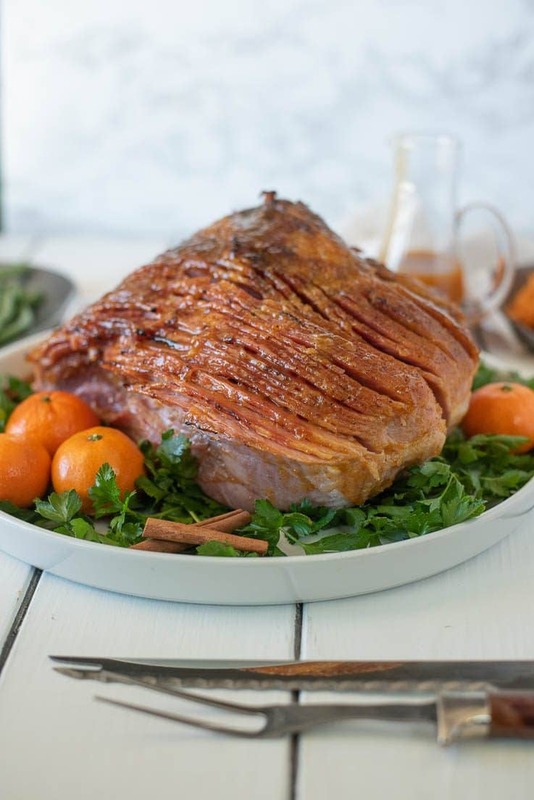 This Mandarin Orange Spiced Glazed Ham is not only perfect for the holidays, it is great to serve all season long for easy family dinners and the leftovers make the best sandwiches for your kids lunches. I love the availability of hams in grocery stores this time of the year that are of great quality so there’s no need to buy mail order or online. You don’t have to be the best cook or spend hours in the kitchen for this glazed ham recipe. Part homemade, part help from the store. You will be proud to serve this to your family and in return, they will be proud to eat your creation. 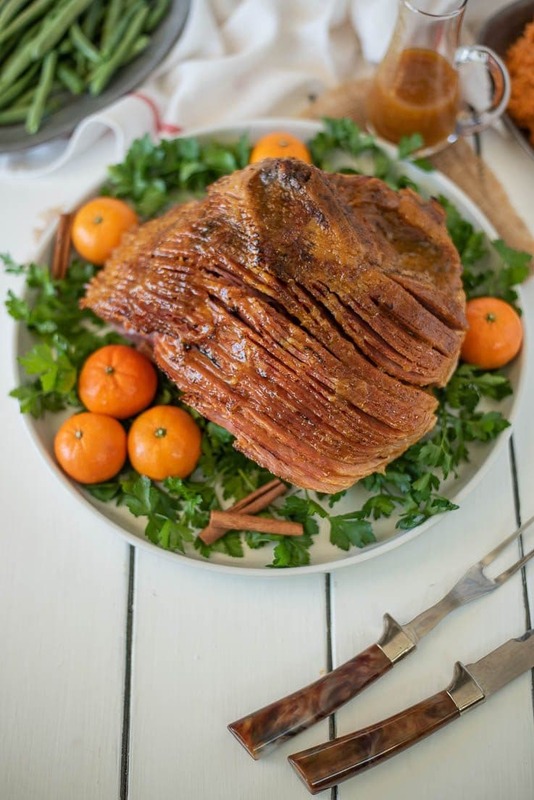 Spiral ham is baked with a mandarin and warm spice glaze and baked until golden and crispy. Position oven rack to lowest position and preheat oven to 350°F/180°C. Add the mandarin oranges to a blender or food processor. Blend until smooth. In a small mixing bowl mix the corn starch with a little water until smooth. Transfer the blended oranges to a small saucepan and whisk in the cloves, cinnamon, ginger, nutmeg and honey over medium heat and bring to a simmer. Whisk in the corn starch and simmer until thickened. Remove from the heat. Place the ham inside a roasting pan. Pour 1/3 of the glaze over the ham coating evenly. Reserve the rest of the glaze for serving. Roast for 1 hour until the glaze is browned. Baste with the glaze and drippings from the pan every 20 minutes. If the top is not browning and getting crispy, you can place it under the broiler for a few minutes at the end of baking. I made this last night for a Christmas dinner party and received lots of yums from my guests and sent them home with leftovers. delicioius and easy. I’m making this for Christmas Eve dinner. I’m glad it was a hit. I made this last night for a Christmas dinner party and received lots of yums, from my guests and sent t hem home with leftovers. delicioius and easy.